Looking for a failproof shrimp biryani recipe? I have one for you! This Instant Pot recipe will yield the most flavorful biryani without a lot of hard work. If you don’t own an Instant Pot, don’t worry you can still make great tasting biryani on your stove top, check out the recipe below. There are various reasons to love Instant Pot such as consistent results, mess-free stovetop but for me, it is the ability to make recipes like this delicious shrimp biryani with very little hands-on time. It is magical – the way Instant Pot churns up this delectable biryani with the shrimp perfectly cooked and with the rice grains perfectly separate just like any good biryani should be. Have you ever accidentally overcooked shrimp? I certainly have. It softens up and loses its crunch and becomes almost jelly-like ..YIKES! To make sure you shrimp doesn’t end up like that, here are some tips when you are making prawns biryani in the Instant Pot. Cook in low pressure – I read somewhere that the low-pressure setting is best for delicate foods such as fish and seafood. Also, in newer models, the default rice setting uses low-pressure mode. So, I decided to cook the biryani under low pressure, such that it is ideal for both the shrimp and the rice and the results were perfectly cooked shrimp as well as rice. Adjust salt/chili powder before adding shrimp – The last thing you want is a bland tasting biryani. That’s why you need to add salt as well as chili powder a bit more than usual so that when you mix rice with the shrimp base, your biryani is full of flavor and doesn’t taste bland. That’s why I do a taste test before I add shrimp and make sure the gravy tastes a bit salty and spicy. Do not add more water than needed. What does that even mean? Just add enough water such that every grain of rice is just about submerged. That’s all the water that is needed. 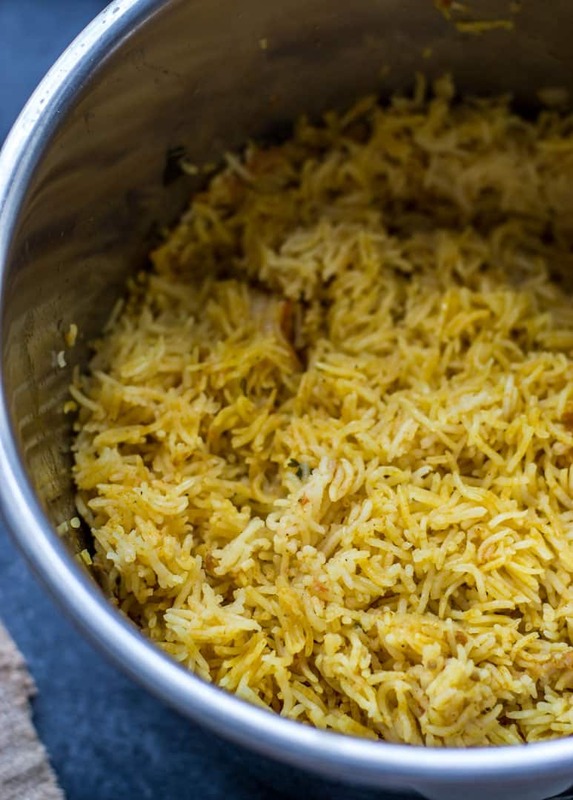 You add more water than that – your biryani will end up being mushy. Jeera rice – aromatic rice basmati rice which is a perfect accompaniment to paneer tikka masala, butter chicken and many other Indian curries. Looking for a failproof shrimp biryani recipe? I have one for you! This Instant Pot recipe will yield the most flavorful biryani without a lot of hard work. Cook the presoaked rice with twice the amount of water and salt (1/4 tsp) till it is 3/4th done. [ Note: I make my rice in the microwave. Normally I keep it for 16 minutes but when I am making rice for pulao I keep it for around 14 minutes]. Then I let it cool. In a medium-sized kadhai or wok kept over medium heat, add 1/4 cup oil. Add peppercorns, cloves and bay leaves, cinnamon stick and when they sizzle (after 10-15 seconds) add onions and garlic. Fry them till the onions turn translucent. Add tomatoes and continue frying till they turn mushy. Add the green chilies, red chili powder, salt, turmeric powder, and shrimp/prawns and mix well. Whisk the yogurt well and mix it with the coconut milk (if you are using it) and add it to the kadhai/wok. Continue to keep it on medium heat till the shrimp/prawns are done. At this point, the gravy should run thick and shouldn't be runny at all. Add garam masala, along with lime juice and mix well. Add the rice and ghee to the kadhai and carefully fold it in and simmer it for 5 minutes covering the kadhai before taking it off heat. Add peppercorns, cloves, cinnamon stick and bay leaves and when they sizzle (after 10-15 seconds) add onions. Fry the onions till they turn soft and translucent (approximately 5 minutes). Add garlic and saute it with the onions for a minute or so. Add tomatoes and continue frying till they turn mushy. Add the green chilies, red chili powder, salt, turmeric powder, and shrimp/prawns and mix well. Whisk the yogurt well, add garam masala and coconut milk (if you are using it) and give it a good stir. Add this mixture to the Instant Pot. Add lime juice and stir it in. Do a taste test - the salt should slightly be on the higher side [see tips above]. Drain the water from the soaked rice and add the rice on top of the shrimp and add just enough water (approximately 1-1/4 cup) to completely submerge the rice. Press “Warm / Cancel” button and then select “Pressure Cook.” Adjust the time to 5 minutes and set the pressure selection at low. Cover the Instant Pot lid and lock it. Make sure the vent is at sealing position. Once the cooking cycle completes, the Instant Pot will switch to the Warm cycle. Press the Warm/Cancel button and carefully release pressure. Open the lid and let the steam escape. Add a tablespoon of ghee and wait for 5 minutes before fluffing the rice and mixing in the ghee. Garnish with coriander leaves and gently mix before serving. – Instant Pot pressure cooker review – Do you really need one? Affiliate Disclosure: I am grateful to be of service and bring you content free of charge. To do this, some of the links on this post are affiliate links, which means that I may earn a commission (at no cost to you) if you click on the link or make a purchase using the link. I only recommend products that I use and love myself, so I know you’ll be in good hands. Your support in purchasing through these links goes towards maintaining this website. Thank you! Just made this. I had a little trouble finding where the Turmeric and chilis were supposed to be added if using pressure cooker, but it turned out well. I am wondering if the rice would have turned out less mushy if I didn’t soak it. Hi, Heather – Thank you so much for your feedback. I fixed the instructions. I understand it was not clear. Soaking basmati rice brings out the flavor and also, with the texture. I am thinking you may have used more water than needed. I will include a picture next time I make this so that it is clear.